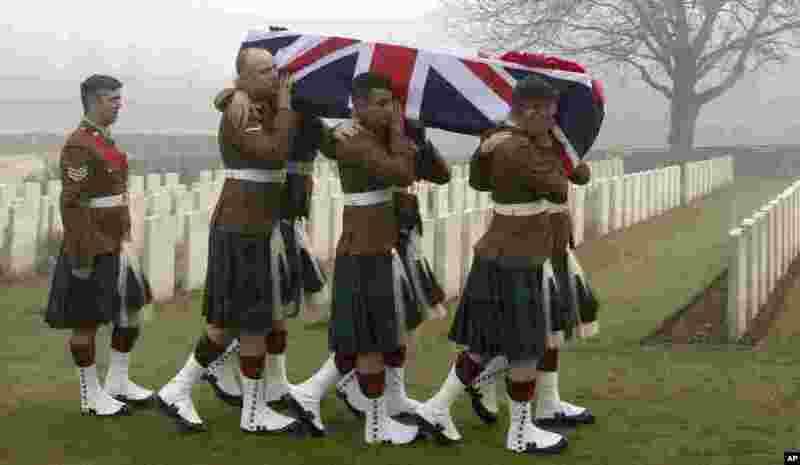 ۱ Military pallbearers carry the casket of British World War I soldier William McAleer during a reburial service at the Loos British World War I cemetery in Loos-en-Gohelle, France. Private William McAleer of the 7th Battalion, Royal Scots Fusiliers was killed in action on Sept. 26, 1915 during the Battle of Loos. His body was found and identified in 2010 during routine construction in the area and is being reburied with full military honors along with 19 unknown soldiers. 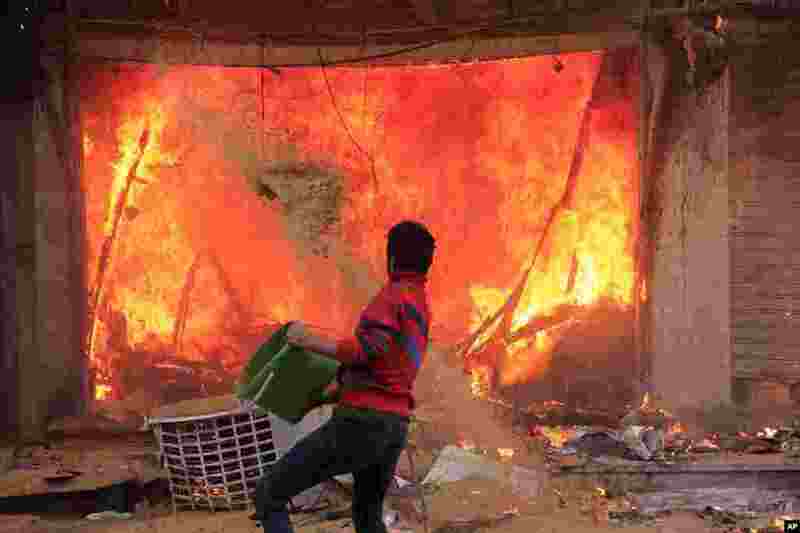 ۲ A civilian tries to put out a fire caused by the Muslim Brotherhood supporters during clashes near the Giza Pyramids in Giza, Egypt. 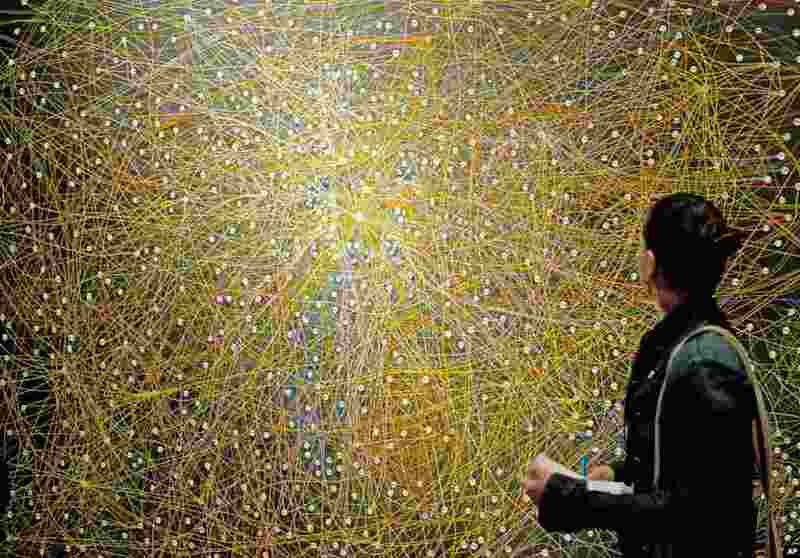 ۳ A woman stands in front of the painting "Connections painting (2007)" in the exhibition "Magazine and Encyclopedia" of New Leipzig School artist Paule Hammer in the City Museum in Jena, central Germany. 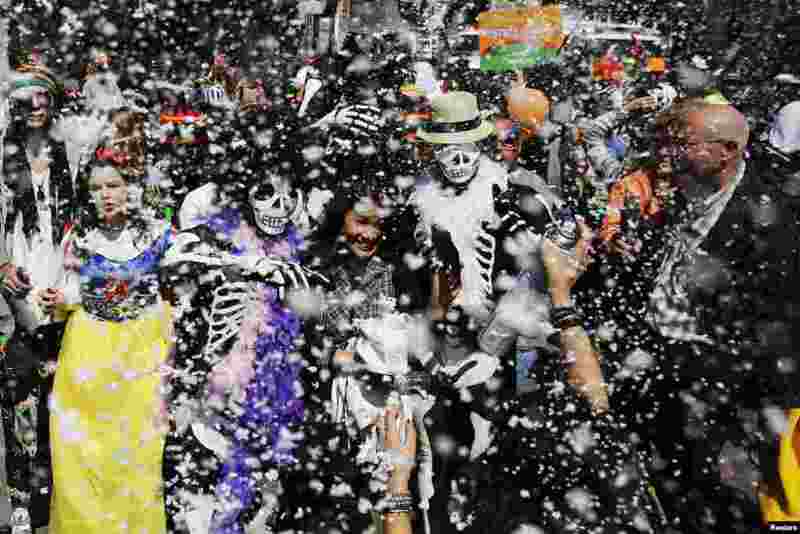 ۴ Revelers in costumes are sprayed with foam during a parade for the Jewish holiday of Purim outside Bialik Rogozin school in south Tel Aviv, Israel. Purim is a celebration of the Jews' salvation from genocide in ancient Persia, as recounted in the Book of Esther. 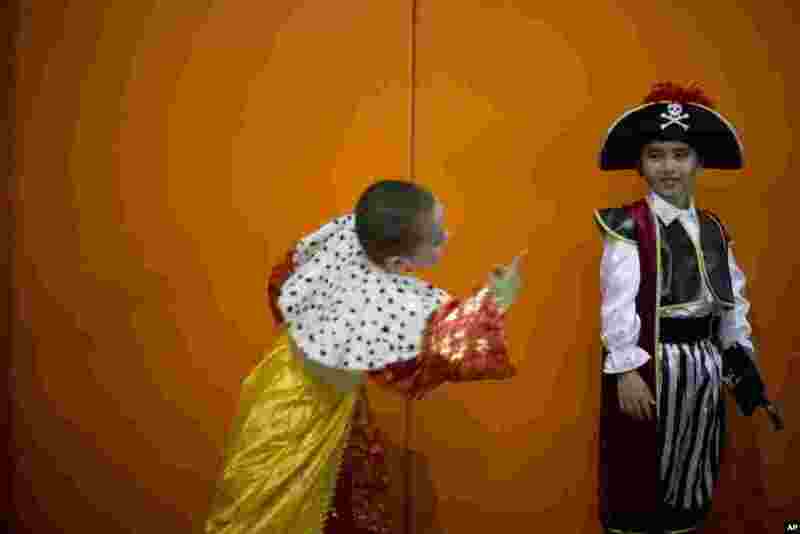 ۵ Young children of foreign migrant workers wear costumes during a Purim party in Tel Aviv, Israel. 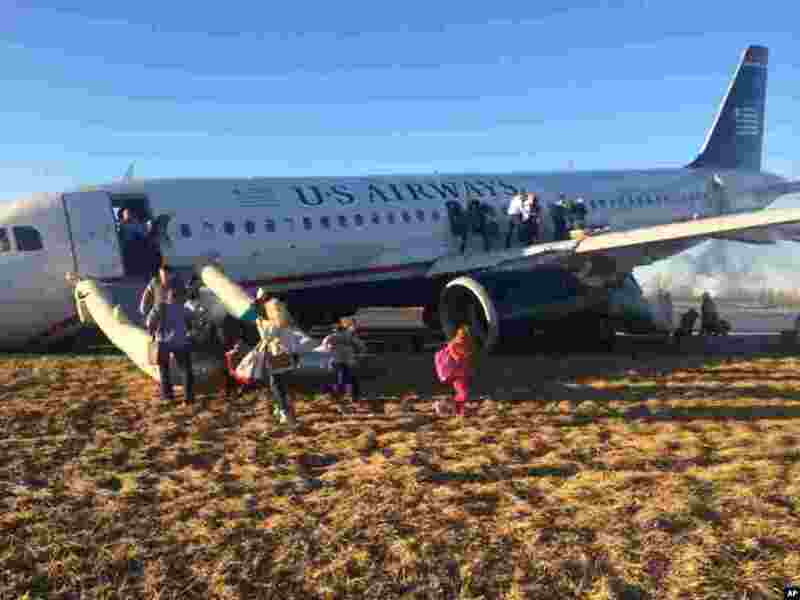 ۶ Passengers evacuate U.S. Airways Flight 1702 after the pilot was forced to abort takeoff shortly after 6 p.m., after a tire on the front landing gear blew out in Philadelphia, Mar. 13, 2014. The Airbus A320 jet, bound for Fort Lauderdale, Florida, was carrying 149 passengers and five crew members, airport spokeswoman Victoria Lupica said. 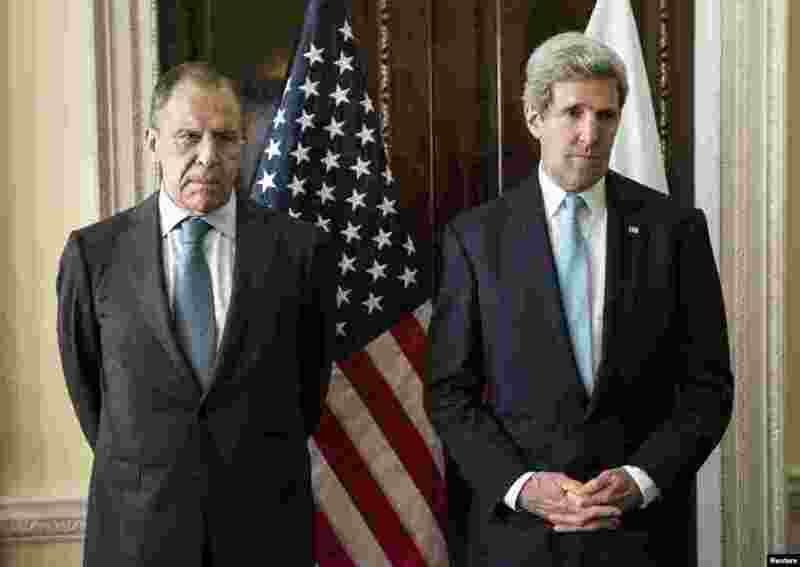 ۷ U.S. Secretary of State John Kerry (R) and Russia's Foreign Minister Sergei Lavrov are seen before their meeting at Winfield House, the home of the U.S. ambassador in London. ۸ National police detains an anti-government protester during a protest against President Nicolas Maduro's government in Caracas, Venezuela, Mar. 13, 2014.